Recently I wanted to reproduce Figure 2 from Watts and Strogatz (1998). The task using igraph is simple but an interesting task was annotation of the resulting plot. Watts-Strogatz model generates graphs that have so called small-world network property. Such networks should have low average path length and high clustering coefficient. The algorithm has three parameters: number of nodes in the graph, initial number of neighbors of each node distributed on a ring and rewiring probability. Interestingly in Watts-Strogatz model having small but positive values of rewiring probability generates graphs having desired properties – and this is exactly depicted on Figure 2 in their article. I decided to replicate it. 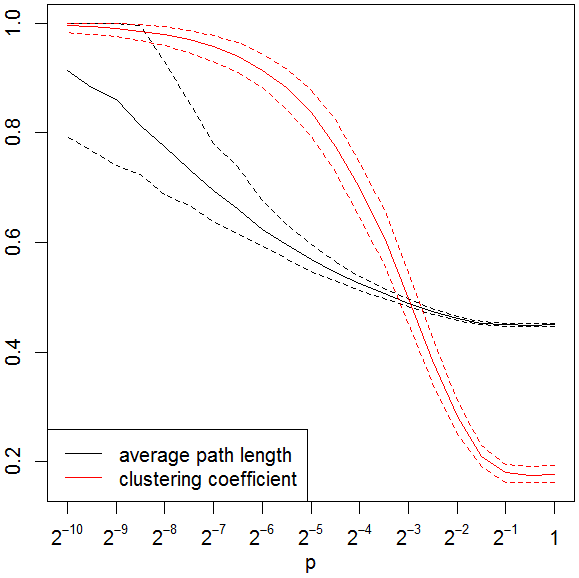 To enhance it I wanted to plot median and 5 and 95 percentile of distribution of average path length and clustering coefficient as a function of rewiring probability. It looks very similar to what is shown in the article (apart from adding lines depicting 5 and 95 percentile of distributions of both graph characteristics). However, the interesting part was to properly annotate X-axis on the plot. Of course you can use expression function to get it but then the problem is that you have to do it ten times. Interestingly parsing a string containing those ten expressions separated by semicolons works just as needed.